The basic STARLAB presentation includes a look at the constellations using the identification system developed by H. A. Rey. Once the students are familiar with the basic shapes, they can then see the night sky shown with over 3,000 stars, complete with an accurate depiction of the Milky Way based on photos by Dr. Axel Mellinger. Students can find the constellations in this starfield, and experience the rotation of the earth and the changing of the seasons. Additional enhancements of the basic program can include a discussion of moon phases and the position of the moon in relation to the starfield, a look at the classic Greek depictions of the constellations we know today, as well as African constellations as seen by the Zulu, Xhosa, Sotho, Tswana, Egyptian, and others or the Chinese asterisms of the Five Palaces originating in 15,600 B.C.E. The Solar System presentation features a depiction of our galaxy and an exploration of the celestial bodies surrounding our sun and the relationships between them. Students can compare the relative sizes of the planets and their relative distances while learning facts about the planets and their moons. This cylinder features 48 constellations using the identification system developed by H.A. Rey. The ecliptic and celestial equator are also shown in this depiction. Circumpolar: Cassiopeia, Cepheus, Draco, Ursa Major, & Ursa Minor. Zodiac: Aquarius, Aries, Cancer, Capricornus, Gemini, Leo, Libra, Pisces, Sagittarius, Scorpius, Taurus, & Virgo. Other: Andromeda, Aquila, Ara, Auriga, Bootes & Canes Venatici, Canis Major, Canis Minor, Centaurus, Cetus, Columba, Corvus, Crux, Cygnus, Eridanus, Hercules, Hydra, Hydrus, Lepus, Lupus, Musca, Octans, Ophiuchus, Orion, Pavo, Pegasus, Perseus, Phoenix, Piscis Austrinus, Triangulum Australe, & Tucana. 1. What is a constellation? Why are arbitrary groupings of stars important? 2. The planets in our solar system can all be found on the ecliptic. 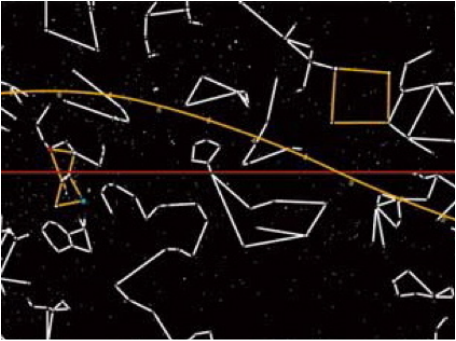 What group of constellations can also be found on this imaginary line? 3. Why are the stars connected with straight lines instead of elaborate pictures? Does this make it easier or harder to identify the constellations? This cylinder features the stars as they would be seen with no light pollution. The digitally-produced projection can simulate the night sky at any time, season, or location. Over 3,000 stars; the brightest stars are individually lensed, resulting in bright pinpoint images; accurate star locations; full color depictions of Betelgeuse, Rigel, Antares, Spica, Arcturus, Capella, and Pollux; blockable aperatures for showing the sun or phases of the moon; a precise depiction of the Milky Way based on Dr. Alex Mellinger’s photographs. 1. Why can you see more stars when you are far away from city lights? Why can’t you see stars during the daytime? Are these things related? 2. Why does Polaris stay put? What is going on with the Earth in relation to the rest of the universe to make this happen? 3. The Milky Way is our galaxy. Why does it look they way it does when viewed from Earth? What shape would it be if you saw it from the outside? Can we ever see it from the outside? This cylinder is an excellent introductory tool for exploring classical Greek folklore. There are 45 Greek constellations depicted on this cylinder over a background of stars. Andromeda, Aquarius, Aquila, Aries, Auriga, Bootes, Cancer, Canis Major, Canis Minor, Capricornus, Cassiopeia, Centaurus, Cepheus, Cetus, Corona Borealis, Corvus, Crater, Cygnus, Delphinus, Draco, Equuleus, Eridanus, Gemini, Hercules, Hydra, Leo, Lepus, Libra, Lyra, Ophuichus, Orion, Pegasus, Perseus, Phoenix, Pisces, Pisces Australis, Sagitta, Sagittarius, Scorpius, Southern Cross, Taurus, Triangulum, Ursa Major, Ursa Minor, and Virgo. 1. Discuss how people in past cultures identified and named constellations, and how they created stories that explained (fictionally) the presence of those constellations in the sky. 2. View pictures of constellations and read the myths associated with them. 3. Drop gum-backed stars randomly onto black paper and stick them down. Use white chalk to connect them into a picture and create a myth about that picture. 4. Legend and myths served as cultural reminders for future generations. Currently, we do not practice the same sky-watching rituals of the past. Why is this? 5. How would the stories be different if we created them today? This cylinder shows constellations as seen by several different African cultures. Many of the constellations mark important agricultural and seasonal events. 1. Africa is a big place. There are up to 6,000 tribes of races and cultures who speak hundreds of different languages. Discuss the reasons different groups of people might have seen different pictures in the sky. 2. Why did many cultures use stars and constellations to signal when to begin planting, plowing, or other agricultural events? 3. Research some African constellation myths in small groups and present them to the class. This cylinder depicts aspects of life in China 5,000-10,000 years ago. Significant constellations were monitored, and decisions and ceremonies were based on celestial events and predictions. Because these predictions sometimes had political ramifications, astronomical observations were considered “classified.” Most of the patterns shown on this cylinder are “asterisms,” or smaller parts of much larger constellations. In general, these asterisms are simple reminders of tasks or places rather than complex stories. Horn (Spica), Heavenly Fields (Virgo), Great Horn (Arcturus), The Emperor’s Mat (Bootes), Celestial Wheel Spokes (Centaurus), South Gate of the Sky (Alpha & Beta Centauri), Great Fire (Antares), Manuring Tray, Southern Bushel, & Emperor’s Black Banner (Sagittarius), The Autumn Marketplace & Footbridge Across the Silver Rivers (various stars), Money String (Corona Borealis), Tortoise (Corona Australis), Weaving Star (Vega), Oxen Driver (Altair & Aquila), Pearls & Ornate Dresses (Capricornus), Coach House (Cygnus), Funeral Mound of the Sun (Equulas & Aquarius), Roof of the House (Aquarius & Pegasus), Four Pillars of Heaven, Thunder and Lightning, Clouds and Rain, & Temple of Light (Pegasus), Awakening Serpent (Lacerta & Cygnus), Eight Evil Chiefs & Outer Enclosure (Pisces), General of the Northern Countries (Formalhaut), Light Infantry Soldiers (Sculptor), Celestial Marshes & Celestial Granary (Cetus), Celestial Boat, Great Trench, Eight Sacks of Grain, & Heaped-Up Corpses (Perseus), Two Hunting Nets or Celestial Snares (Taurus & The Pleiades), Five Chariots & Tie-Up Posts (Auriga), Supreme Commander Tsan (Orion), Well & Celestial Vessel (Gemini), Northern River, Two Love Butterflies, & Yin-Yang Symbol (Castor & Pollux), Celestial Jackal (Sirius), Bow and Arrow (Canis Major), Old God Who Shoots Celestial Dog With Bow and Arrow & Willow (Hydra), Water Flowing (Leo), Chariot (Corvus), Northern Bushel or the Balance of Jade (Ursa Major), Imperial Prime Minister and the Crown Prince (Ursa Minor), Sky Emperor and His Wife (Polaris), Bridge of Kings & Whip (Cassiopeia), Chariot & Inner Throne of the Five Emperors (Cepheus), Container to Hold the Woven Garments & Flail (Draco). 1. Based on the locations of the Chinese asterisms, which ones do you think are most important? Which ones contain the brightest stars? 2. The Chinese sky is divided into five large sections. Why do you think that is? How does this make studying constellations easier? How does it make it harder? This cylinder features our galaxy and solar system. The artistic representation of the Milky Way Galaxy is based on recent astronomical color studies. The Solar System is represented using two different scales, as well as other celestial bodies found in the neighborhood of our sun. The planets in order of distance from the sun, planet sizes relative to each other and to the sun, planetary distances relative to each other and to the sun; information for each planet includes the distance from the sun in millions of kilometers and in astronomical units (a.u. ), the diameter of the planet in kilometers, rotation, orbital period, mean surface temperature, and major moons. 1. Our galaxy is a spiral galaxy. What other types of galaxies exist? How many of them are there? How do we know? 2. Where in the night sky can you find the next closest galaxy to ours? Is it moving toward our Milky Way or away from it? 3. What are the peculiar aspects of Pluto that have brought into question its status as a planet? 4. Why is Earth suitable for life? Could any other planets in our solar system support life? Why or why not? 5. What is an astronomical unit, and how did astronomers come up with that distance?